A Hans Christian Andersen tale about tails. Hans Christian Andersen’s The Ugly Duckling is off and running again. This time in much-admired musical Honk at The Rose. The show first saw the light of day in 1993 in England, garnering an Olivier Best Musical award in 2000. It also won an Elliot Norton Award in the U.S. a year later. The story is clearly familiar. It’s about being different from the rest of the flock. A gentle plea for tolerance. Lots of creatures populate this version of the tale, no humans in sight. The music is by George Stiles, the lyrics and book by Anthony Drewe. Their songs have come in for special praise. “A sweet show ….the emergence into the major leagues of the composer-lyricist team,” said Variety. And The Guardian cited “a host of memorable tunes and some neatly pointed humour.” https://en.wikipedia.org/wiki/George_Stiles https://en.wikipedia.org/wiki/Anthony_Drewe. These men also wrote songs for the hit stage version of the film Mary Poppins, the same one The Rose presented in June last year. Stiles and Drewe have written other takes on famed stories such as Peter Pan, Goldilocks and The Three Little Pigs, not to be confused with scores by Mark Charlap, Jule Styne, Carolyn Leigh, etc. nor Rodgers and Hammerstein’s just seen at The Orpheum. 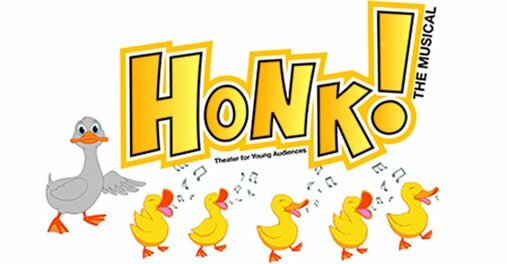 Thirty characters are played in Honk by a cast of thirteen of which four are Drama/Theater students at The Rose. There’s a pre-recorded score, with Music Director Jerry Brabec in charge of the singing. The stage director is Cynthia Gendrich; Sue Gillespie Booton choreographed. This is a 70-minute, intermission-less performance perfect for anyone age 5 or way above. And for admirers of good show songs, this could be a revelation.